The Holy Martyr Archbishop Seraphim of Uglich was a hierarch of the Church of Russia during the early twentieth century, a missionary under St. Tikhon of Moscow to the Alaskan people, and a stalwart defender of Orthodox Christianity against the persecutions of the Bolshevik government of Russia. Semyon Nikolayevich Samoilovich was born July 19 of either 1881, 1882, or 1885 (sources differ) into a family of a parish priest in Poltava province of Russia. After attending local schools, Semyon enrolled in the Poltava Theological Seminary from which he graduated in 1902. After graduation Semyon was sent as a missionary to the Diocese of Aleutian Island and North America as teacher under the diocesan bishop Tikhon (Bellavin). In 1905, Semyon elected to become a monk and was tonsured, receiving the name Seraphim. A month later he was ordained a deacon. A year later in 1906 he was ordained a priest. During his time in Alaska, Fr. Seraphim took a number of assignments for which the dates are not clear. For a while he taught at the school in Unalaska in the Aleutian Islands, then at Sitka in 1905. In late 1906, he was assigned to the Nugeka mission before returning the Sitka to teach Scriptures and theology at the seminary during 1907 and 1908. By 1908, Fr. Seraphim’s health began to be affected by the harsh Alaskan climate, and he returned to Russia. His early years after returning to Russia are unclear as sources differ as to his assignments. One line has Fr. 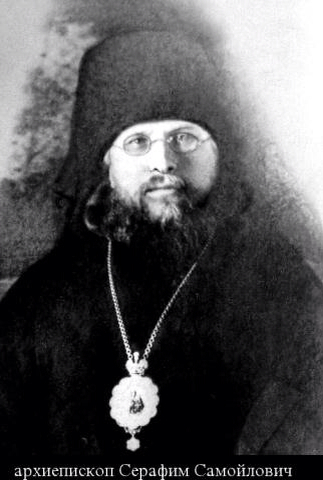 Seraphim, in turn, assigned in 1908 as an assistant to the Yaroslavl diocesan mission, followed by an assignment to the Alexandrosky Theological Seminary in 1909, and then in 1910, as prior, at the Mogilev Bratsk and Tolga Yaroslavl monasteries, before an assignment as abbot at the Uglich Alexandrosky monastery. The other thread has Fr. Seraphim assigned as abbot of the Tolga Monastery, a few miles north of Yaroalavl, by Abp. Tikhon, who was Archbishop of Yaroslavl, after his return from North America in 1907. At Tolga, Fr. Seraphim led the preparations for the six hundredth anniversary of the monastery in August 1914 and established a school for beekeeping for the orphan children cared for by the monastery. After the start of World War I, at Tolga, Fr. Seraphim’s efforts were erecting hospital wards and assisting Abp. Agathahgelus govern the diocese. In the event, after defending the monastery against the Bolsheviks at Tolga, Fr. Seraphim was transferred to Uglich as abbot of the Protection Monastery. Following either thread, Fr. Seraphim was elevated to the dignity of archimandrite while in Uglich. On February 2, 1920, he was consecrated Bishop of Uglich, vicar to the Yaroslavl Diocese, by Patr. Tikhon. During the following years Bp. Seraphim became involved in the chaos in which the Church was placed by the persecutions of Bolsheviks. In 1922, Bp. Seraphim was arrested and imprisoned for the first time by the Bolshevik authorities for anti-government activities. He was released after a term in prison and, in 1924, he was elevated to archbishop. In 1925, he was appointed administrator of the Diocese of Yaroslavl. After the death of Patr. Tikhon in 1925, the Church was thrown into complete chaos as the Bolsheviks championed the hierarchy of the ‘’Living Church’‘ in their attempt to destroy the Church. Leadership of the Church became uncertain with the systematic arrest of the hierarchs named by the patriarch in the event of his death. During this period, from November 30, 1926 to March 27, 1927, Abp. Seraphim became the “Substitute of the Patriarchal Locum Tenens” while Metr. Sergius was in prison. During this time Abp. Seraphim was approached by the Bolsheviks to form a new Synod, providing him with a list of hierarchs they wanted, but he refused the list and gave them a list of his own. The Bolsheviks retaliated by removing him from office. At the same time they released from prison Metr. Sergius, who took Abp. Seraphim’s place. In July 1927, Metr. Sergius capitulated to the Bolsheviks and issued his “declaration” submitting to the government. The Synod that he formed was found to be those hierarchs on the list the government presented to Abp. Seraphim. On January 24, 1928, Abp. Seraphim together with Metr. Agathangel of Yaroslavl, Metr. Joseph of Petrograd, Abp. Barlaam of Perm, and Bp. Eugene of Rostov issued an epistle strongly rejecting the declaration. Abp. Seraphim was then arrested and sent into exile to Mogilev. In 1929, he was sentenced to five years at the old Solovki monastery, and condemned to work at hard labor. During this time he fell from a ladder and became an invalid. But these persecutions could not break his indomitable will. After his “release” in 1930, sources vary on his life. In May 1932, he was reported as exiled to the region of Komi. In 1934, he is reported to have been sent in exile for five years in the Kemerovo camps in Siberia. Some source noted his execution in 1937 (reportedly on November 4 or 9), while others just note he did not return from exile.